Following the success of our book-in-a-day event ‘Working it Out’ at the CCA in Glasgow earlier this year, and the long-awaited anthology Seasons of the Mind, the group spent the day making their own booklets of writing and artwork. 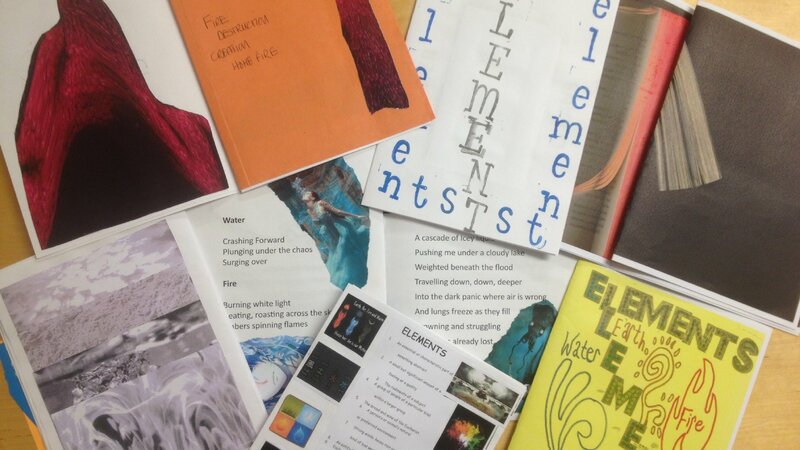 Using collage techniques, poetry, found text, word-art, and whatever inspired us, members of the group made twelve page booklets themed around the ‘Elements’. For some it began with Earth, Wind, Fire and Water and grew from there, for others it was about exploring the elements of themselves or their surroundings in the Library on the day. Thanks so much to Hazel at Stevenston Library for hosting us, and to the Scottish Book Trust for kindly supporting our event.